Part of our award winning Russian Trio Set. 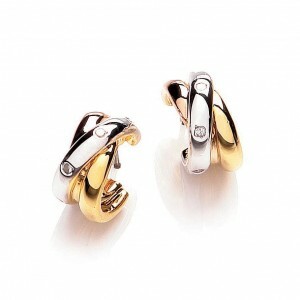 Each individual band is plated with either real 18k gold, rose gold or rhodium to create the three colors. Each piece is then hand polished to give a high lustre. The stones are hand set clear cubic zirconia. Features a post and butterfly fastening for pierced earrings only. Diameter 15mm. A perfect compliment for the Russian bangle (CZBA138), pendant (CZGN229 and ring (CZR435).